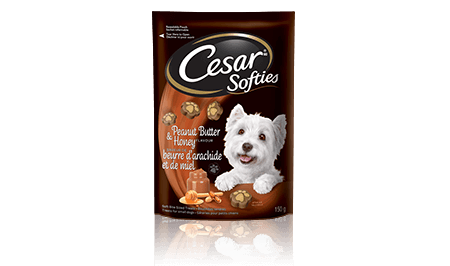 CESAR® SOFTIES™ PEANUT BUTTER & HONEY FLAVOUR 150g is rated 5.0 out of 5 by 2. Rated 5 out of 5 by Toma from great treat Been buying Cesar treats for 10 plus years for my Shih Tzu 11 years old, his favourite treat after dinner problem is -they (Peanut Butter) are presently no where in the Niagara area, to be found ! no Walmart, Canadian tire or any grocery store chain Are they no longer available ? RICE FLOUR, WHEAT FLOUR, SUGAR, GLYCERIN, PROPYLENE GLYCOL, ANIMAL FAT (PRESERVED WITH BHA), WATER, NATURAL POULTRY FLAVOUR, POTASSIUM CHLORIDE, ARTIFICIAL PEANUT BUTTER FLAVOUR, SALT, ARTIFICIAL HONEY FLAVOUR, CALCIUM PROPIONATE, POTASSIUM SORBATE, CARAMEL COLOUR, HICKORY FLAVOUR, SODIUM TRIPOLYPHOSPHATE, TITANIUM DIOXIDE.